Uyghurs attend an anniversary of the establishment of the East Turkestan Republics in Washington, Nov. 12, 2013. Ethnic Uyghurs from around the world gathered in Washington this week to commemorate the anniversary of two short-lived independent republics set up by their forefathers within what is today called the Xinjiang Uyghur Autonomous Region in China. Around 100 Uyghurs attended a ceremony on Tuesday at Capitol Hill in Washington to remember the establishment of East Turkestan republics on Nov. 12 in 1933 and 1944. 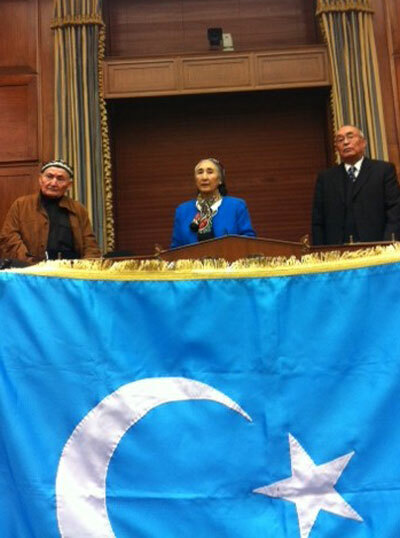 Ughyur activist and president of the Munich-based World Uyghur Congress Rebiya Kadeer praised the efforts of those who had founded the republics and called on the Uyghur people to remain strong in spirit despite what she called a policy of “repression” under the current Chinese government. “The Uyghur people have been suffering under the oppressive government of China since the destruction of the Uyghur republics, however, the level of repression has since been extended to our beliefs and customs,” she said at the ceremony at the Rayburn House of Representatives Office Building. Kadeer slammed the Chinese leadership for denying Uyghurs the right to “practice their religion openly and freely” and for an ongoing campaign of discrimination against the mostly Muslim ethnic group who call northwest China's Xinjiang their home. She also condemned Beijing’s tightened security measures, which include house-to-house raids targeting Uyghur families and which have led to a string of violent incidents in Xinjiang in recent years. “China should understand that by suppressing our people [the government] cannot silence the Uyghur call for dignity and freedom,” she said. The movement behind the First East Turkestan Republic, which was established in Xinjiang’s Kashgar area, grew out of a desire to strengthen the state of education amongst Uyghurs and came to a head in response to official policies promoting the Sinicization of the local populace, according to reports. It was put down only months later by the forces of local Chinese warlord Sheng Shicai backed by Soviet troops, as Moscow reportedly feared that the Uyghur movement for independence could spread to territory along the borders with China. The second republic was established in northern Xinjiang on Nov. 12, 1944 with Ghulja as its capital after China’s nationalist Kuomintang (KMT) Party under the leadership of Chiang Kai-Shek removed Sheng from power and subsequently lost control of the area to local Uyghurs supported by Moscow. After the KMT administration in Xinjiang surrendered to the Communist People’s Liberation Army (PLA) in mid-1949, the Second East Turkestan Republic was absorbed back into China by the end of October that year. During Tuesday’s ceremony president of the Washington-based Uyghur American Association Alim Seytoff read a letter of congratulations from U.S. Congressman Frank Wolf to Kadeer for her work in highlighting human rights abuses by the Chinese government against Uyghurs. “Our own State Department in its annual human rights report acknowledges the severe official repression of the freedom of speech, religious association and the harsh restrictions on the movement of ethnic Uyghurs,” the letter read. Following the ceremony at Capitol Hill, a group of Uyghurs held a protest in front of the Chinese Embassy in Washington. Reported by Gulchehre Keyum for RFA’s Uyghur Service. Translated by Mamatjan Juma. Written in English by Joshua Lipes. I hope that one day both Uyghurs and Tibetans will be free of Chinese colonial rule and Tibet & East Turkestan will both be independent again.